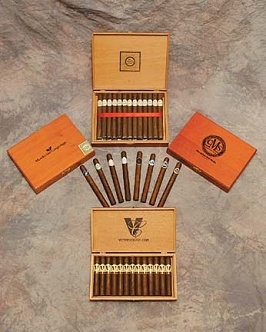 As the undisputed leader in premium custom label cigars, VictoryCigars.com is the choice the world over for any occasion. At Victory, we pride ourselves on two things: first class customer service and the consistent quality of our private label cigars. Guaranteed. We extend our sincerest thanks to our over 20,000 satisfied customers! Our private label cigars are hand made in the Dominican Republic using only the finest tobaccos available. From the novice to the aficionado, our cigars are certain to please everyone. All of our custom private label cigars are packaged in beautiful Spanish Cedar boxes. Each box contains 25 cigars with custom bands featuring our customer’s logo and/or custom design. Corporate Gifts & Events: Your logo on the band makes the perfect Corporate Gift! 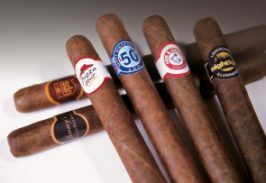 Fine Restaurants, Resorts, Hotels & Clubs: Customized cigars make great Promotional Items! Sports & Entertainment Events: Promote your event with custom label cigars! Charity Events, Premieres & Parties: Need Promotional Items? Just add your event logo! Weddings, Births, Birthdays . . . and more! What a great way to memorialize your special day! Call us toll free today at (800) 434-3994 or use our convenient online order form to order the finest custom label cigar available! As every cigar aficionado knows, maintaining the proper environment for the storage of your cigars is a must. VictoryCigars.com, the undisputed leader in premium custom label cigars, is proud to offer a solution to this problem. We’ll give you this beautiful humidor absolutely FREE! Finished in cherrywood, lined with Spanish Cedar, and equipped with a humidifier and hygrometer, this 25 ct. humidor is sure to please even the most discriminate of tastes! Simply place an order for 10 or more boxes of our premium custom label cigars, and receive this humidor as our free gift to you. I am pleased to report that the cigars you prepared for my husband’s surprise party were a smashing success. As good as promised. Thanks of making this a memorable event.